A second round of talks on renegotiating NAFTA will kick off Friday in Mexico City, where officials from the U.S., Mexico and Canada will discuss how to modernize the trade pact, even as President Trump repeatedly threatens to abandon the accord if it doesn't meet his demands. New proposals are expected to be introduced this weekend, according to Raul Urteaga Trani, a Mexican official who is advising his country's trade negotiators. But he declined to say what specifically will be discussed. Mexico has frequently said the 23-year-old North American Free Trade Agreement must be modernized, with improvements needed in the energy and e-commerce sectors, according to Mexico's Foreign Minister Luis Videgaray . Trump, however, believes the deal needs a complete overhaul, calling it the "worst trade deal ever made." He has also threatened to pull the U.S. out of the pact. "Hopefully we can renegotiate it, but if we can't, we'll terminate it and we'll start all over again," Trump said during a speech in Missouri on Wednesday. Urteaga Trani is one of several Mexican officials who tell CNN they see Trump's rhetoric as a strategy to get the deal he wants. "This is perhaps a negotiating strategy coming out of the White House," he said. Luis de la Calle, one of Mexico's original NAFTA negotiators, said he does not believe Trump will ultimately pull out of NAFTA due to pressure from Congress and business leaders. But he said a successful trade deal will require all three countries to join together to become a more competitive North America. "Today there is doubt that the U.S. has the same objective as Mexico and Canada," he said. Mexico is the U.S.'s third biggest trading partner, with $525 billion in total goods traded during 2016. Canada and China round out the United States' top two trading partners. Trump has been vocal about the changes he believes will benefit U.S. job growth, and he has repeatedly said he wants to close the $63 million trade deficit with Mexico. De la Calle disagrees with Trump about making budget deficits part of the negotiations. Currently, more than 5 million U.S. jobs depend on trade with Mexico, according to the U.S. Chamber of Commerce. Earlier this week, Mexican Foreign Minister Videgaray met with the U.S. trade representative heading the American negotiating team in Washington D.C. The Foreign Minister emphasized his country "will not negotiate any aspect of bilateral relations...through social media," a reference to Trump's penchant for Twitter. The U.S. has already staked out positions that Canada and Mexico oppose in renegotiating NAFTA. It wants to remove a key, though controversial, element that protects companies' investments abroad. It also wants to scrap a dispute settlement mechanism and change another provision that could force companies to manufacture more in the U.S.
Mexico says it will turn to other markets for trade if all three countries cannot agree to a deal. Officials are already exploring other trade options in Asia and Europe, said Carlos Sada, the Foreign Ministry's Undersecretary for North America. "We are negotiating a broader treaty with the EU because it has been beneficial for Mexicans and ...[it] is what we're going to continue to work towards," he said. During this weekend's NAFTA negotiations, Mexico's economic secretary and President Enrique Pena Nieto will head to China -- a move that signals the country can pursue other trading partners. China and Mexico, along with other countries, plan to hold an "economic dialogue" in Beijing. The next round of NAFTA negotiations are expected in late September in Canada. 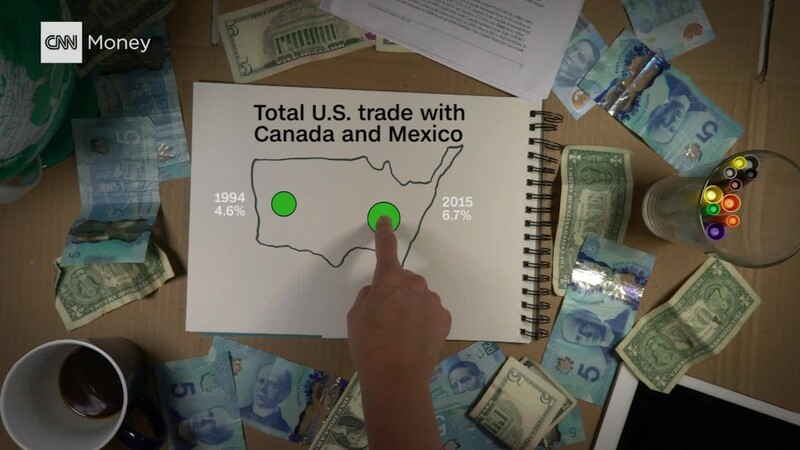 During a first round in Washington this month, Canada and Mexico praised the pact for the economic gains it has brought to all three countries. Robert Lighthizer, the top U.S. trade official, slammed the pact as a job-killing, factory-closing deal. Mexico's upcoming presidential election could play a significant role in the timeline for negotiations. Next July, the country will have a new president. A new administration south of the U.S. border could set a different tone for discussions and signal time is running out for Trump to get the deal he wants.